First Line: This was one pitiful-looking mansion. Mel(anie) Turner may dress like a Madonna groupie, but she knows her stuff when it comes to renovating historic homes in the San Francisco Bay area. 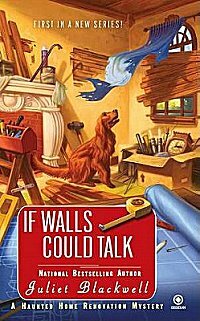 Her latest client wants her expertise in bringing a Pacific Heights mansion back to life, but when she visits the morning after a boozy "Do-It-Yourself" remodeling party, she discovers his partner-- who seems to have had a horrendous accident with power tools. The man dies as a result of his injuries, and as Mel begins to see that certain facts and figures just don't add up, she also gets a visit from the dead man's spirit. Murderous intent fills this particular down-at-heel mansion up to its eaves. To me, old houses might as well be ancient pyramids. They hold secrets and messages from the past; I feel them whispering to me as I walk the hallways. Walls, attics, basements... over the past five years I had found newspapers from the thirties, liquor bottles, old coins, address books, even the occasional stash of money or stocks. I once unearthed a button-up baby's shoe and a dress pattern book from 1916. I even liked the smell: the distinctive, musty aroma of history, reminding me of used bookstores...promising the serendipitous discovery of the perfect novel or family relic or beloved treasure. Once I read that paragraph, I knew that Mel and I were going to get along just fine. She and I have the same feeling for old houses, and as I turned the pages, my affinity for this character grew through her relationships to the other characters and to the way she conducted her business. If I had an old mansion to renovate, I'd hire her on the spot. Blackwell paced the story well, and although I had a hazy idea of whodunit, I was so drawn in by Mel's character, the action, and the bits of San Francisco history the author shared that I didn't focus on it. I was enjoying Blackwell's storytelling so much that I didn't particularly care whom the killer was. I am really looking forward to the next book in this series, and I hope that Mel never runs out of old mansions to renovate. Sounds so intriguing. Old houses always have secrets and histories. Glad the woo-woo isn't too strong. I love it when I'm so caught up in the story that I'm not trying to figure out the mystery. Mystica-- Yes, they do. Sometimes we're lucky enough to learn what those histories are. Dorte-- I went through a period of my life having dreams like that. It didn't bother me either! I can't wait to get to my copy of this one. I've enjoyed all the books I've ready by this author. This looks pretty good. Don't mind a bit of woo-woo myself. Kris-- This is the first I've read by this author, and it won't be the last! Traci-- Yes, well-done woo-woo is fine.